The Leica BLK360 Imaging Scanner is the smallest and lightest 3D imaging laser scanner available. Napco is the ONLY company in the NYC area where you can get a demo on the Leica BLK360 3D scanner! Call Keith McHugh or David Cramer for details. (201) 438-1500. Using the Leica BLK360 you can capture the world around you with high resolution 3D panoramic images. The ReCap Pro mobile app helps the BLK360 stream image and point cloud data to your iPad. The app filters and registers scan data in real time. After capture, ReCap Pro enables point cloud data transfer to a number of CAD, BIM, VR and AR applications. 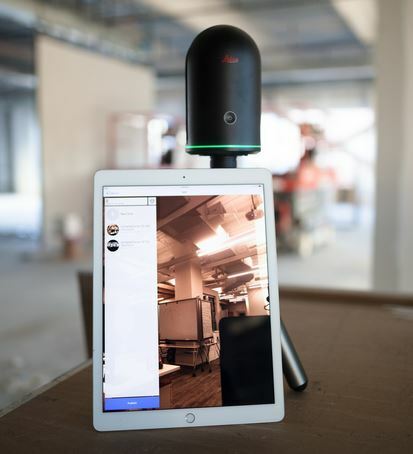 The integration of the Leica BLK360 3D scanner and Autodesk software dramatically streamlines the reality capture process thereby opening this technology to non-surveying individuals. Don't buy Leica BLK360 3D Scanner without contacting Napco. Call us today at 1-866-752-6766.